As 2012 came to a close, homelessness in New York City continued to soar to record levels. The number of people sleeping in emergency shelter each night has reached a staggering 50,000 – more than 20,000 of them children – and the effects of Hurricane Sandy have left countless more of our neighbors homeless, hungry and in desperate need of help. Record homelessness and the disastrous effects of Sandy come at the same time that many other service providers in NYC have eliminated programs or closed altogether due to economic hardship, creating a tremendous surge in need. To help our critical frontline services meet the unprecedented demand, the Coalition has increased efforts to engage the private sector for help. In October we launched a new Corporate and Law Firm Sponsorship Campaign – an innovative collaboration with New York companies and firms to support the Grand Central Food Program (GCFP). 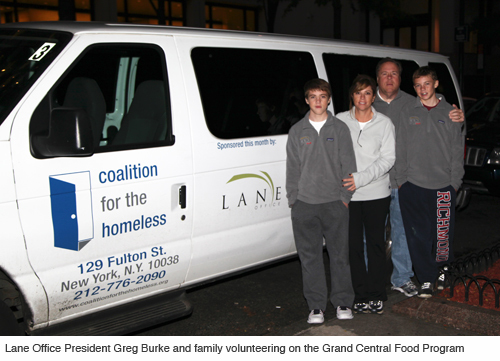 For nearly 30 years GCFP has been delivering life-saving meals to nearly 1,000 homeless and hungry men, women and children on the streets of New York City each night. on the van for that month, and the Coalition gratefully and publicly acknowledges the sponsor’s generosity on its website and in social media. 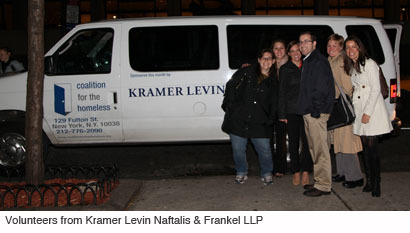 It’s been truly inspiring to see New York’s legal and corporate communities respond to the crisis by stepping up to help us continue this critical program, and we look forward to working with many more sponsors in the future. If your company or law firm is interested in learning more about becoming a GCFP sponsor, please contact us at pbayley@CFTHomeless.org.